Lugh’s companions muttered angrily amongst themselves, and shifted restlessly. Lugh motioned for them to stay calm. ” We are warriors come from afar to join Nuada’s army. We wish to join him in battle against the Fomori. What kind of hospitality is this? ” he called. Lugh’s men were all for battering down the gate, and it was all Lugh could do to restrain them. They shot murderous glances at him, and Lugh didn’t fancy the gatekeeper’s chances when they finally gained entry. He determined that no jobsworth was going to get the better of him. ” I am a mighty warrior, and more than that, a proven champion in single combat! ” Lugh announced proudly, and his followers cheered approvingly. ” Well, then, I am trained as a smith, and have skills in working all manner of metals, be it iron for the sword, or silver for the brooch, or gold for the torc. ” Lugh’s friends smiled at this, and thumped him on the back, sure they would now be ushered through, for was not the skill of forging a sword more prized than any other, save the wielding of it? ” Goibhniu is our smith, and he is master above all other smiths. Credne is our brazier, and none can match him for working bronze and gold. Moreover, they have many talented underlings toiling in their forge, so you see, we do not lack for metalworkers. ” The gatekeeper was sounding increasingly irritated. ” Hold hard there, doorkeeper, for there is more! I have mastered the arts of building, and carpentry. Who do you have to match me? ” Lugh answered with a grin; he was enjoying the game immensely, which was more than could be said for his opponent. Or his friends. ” Ho! I am not through with you yet! Have I told you of my wondrous ability for healing the sick and injured? ” asked Lugh. ” So! Will you let us in? ” Lugh’s companions demanded impatiently. ” How do I know you are telling the truth? ” asked the gatekeeper suspiciously. Lugh and his men heard bolts being withdrawn on the other side of the mighty gates, and then they swung slowly and heavily open. 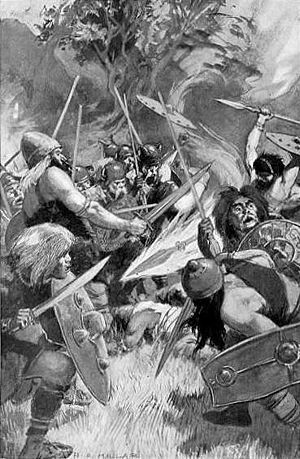 Quick as a flash, Lugh’s men were through, and the unfortunate gatekeeper found himself surrounded, with any number of blades pressing at his throat. Lugh shouldered them aside, laughing. Gamal led them into the great hall, where they were presented to Nuada. The hall itself was larger than anything Lugh and his men had ever seen before. Huge fires were lit at each end of the room, and many tables and benches laid out between them, where men and women sat feasting and drinking. The King himself occupied a table beside one of the fires, with his wife Macha at his side, and his sons and closest friends and advisors all gathered about him. Entertainers wandered amongst the crowd, telling stories and jokes, performing tricks or feats of agility or strength. The strains of music drifted from one corner, where a group of musicians played. Servants scurried back and forth, fetching more meat or drink. Children played freely, the King’s dogs joining in their rough and tumble. Skins and rugs covered the earth floor, and beautiful, finely worked wall hangings decorated the wooden walls. Hundreds of candles lit up all the action. Lugh guessed it was a fulltime job for someone just to run around replacing them all as they burned low, for there were so many. The air was filled with the scent of wood smoke and cooking food, and their ears bombarded by the sound of all those guests chatting and laughing. The king lounged in his intricately carved throne, and stared at Lugh expectantly. He saw a tall, well muscled young man of cunning and intellect standing proud and erect before him. His hair, somewhere between red and blonde, curled about his head and shoulders like a golden halo in the firelight. The rough hands and old burns on his forearms spoke of years of toil at the forge, and the workshop, yet the scars he bore about his person indicated a man of the sword. A sensitivity around the mouth and eyes belied a tendency towards the artistic, and the pouch of herbs at his belt was the give-away sign of a healer. This was clearly no ordinary young man. The King felt himself drawn to this stranger in friendship, but what he liked most about him was the way the boy’s eyes met his own fearlessly and appraisingly. There was softness there, but also a hard edge in equal measures. If I am any judge of the character of a man, then this one is meant for greatness, Nuada thought. ” I hear men call you the Samildanach. ” he remarked. ” It is true. I am skilled in all the arts. ” replied Lugh, but without the manner of one who brags. Lugh nodded his agreement. Quite a crowd had gathered to watch this feat. Ogma looked certain of victory, and led the way out of the hall to the site of the stone. Using his great brute strength, he wrapped his arms around the rock and began to lift. Calling upon his magic powers he raised the stone and threw it mightily over the palisade to the other side of the outer ditch, where it landed with such a thud, the ground shook, and the vibrations could be felt for miles around. The people of the Denann cheered for their champion, but undaunted, Lugh calmly and quietly went after the stone, and easily threw it back. Folk ran screaming to get out of the way as the huge missile made for its target and embedded itself deeply in the earth from which it had been torn. ” I have fulfilled your challenge. Now give me your champion’s badge. ” So Ogma relinquished his position as King’s champion to the Samildanach, as agreed. Without a word, Lugh took down his small harp, and drew from it such keen and beautiful melodies, that all were moved by the mood of it, be it laughter, or tears. Afterwards, Cas Corach himself declared Lugh no less than a master harper. ” I am impressed by all that I have seen, young man, but entertain me once more, I beg you, and join me in a game of Fidcheall. ” said the King. Fidcheall was a board game involving an equal number of playing pieces, one set against the other, on a wooden board divided into squares, seven by seven across. Three hours later, Nuada found himself unexpectedly defeated. He looked at Lugh secretly through narrowed eyes, and wondered if he could be the man to lead his army to victory against the Fomori. ” Who are you? ” he asked. There was much rejoicing among the Denann at this, for one of their own was now returned to them. Cian came forward to embrace his long-lost son, as did Dian Cecht, his grandfather. The King observed this and thought, he is of noble birth, and qualified more than most to be my battle champion. Lugh was welcomed into the Tuatha de Denann and consequently made Ollamh Eirean, Chief Bard of Literature and History, thus taking on a position which carried equal status with the High King himself.